The economy may be moving toward improvement, but there are still plenty of us who need to watch our nickels and dimes. Occasionally, when I read cigar reviews and rankings, I’m reminded of years ago when the New York Times food writer wrote lovingly about a $4,000 meal he enjoyed in Paris. The Daily News followed with a hilarious parody, sending a reporter to dine for a few dollars somewhere like the Bowery. I mean, if you’re paying $4,000 for food—or $20 for a cigar—you’d hope they‘re good, wouldn’t you? But you don’t have to spend that much for an enjoyable cigar. Whether you’re a new smoker looking to experiment or a grizzled vet eager to save a buck, your selections don’t have to be a crap shoot. Many top blenders and manufacturers have lines that won’t break the bank. Here are a few suggestions to get you started. I doubt you’ll like them all, but I’d be equally surprised if you don’t enjoy at least one. Prices vary depending on sizes and local taxes, but you should be able to find them for around $5 or less. 1) La Traviata: This CAO line takes its name from an old Cuban production. It’s a multinational blend, with an Ecuadorian Habano wrapper, a Cameroon binder, and filler from Nicaragua and the Dominican Republic. A medium-strength cigar with lots of leather. 2) Benchmade: A Don Pepin Garcia creation, these pigtailed Nicaraguans are “sandwich” style with short filler. They lack the consistency and burns of long-filler cigars. Nonetheless, I’ve found them remarkably enjoyable. 3) Brick House: A medium-strength line from J.C. Newman, these cigars sport an Ecuadorian sungrown wrapper and lots of flavor. Construction is first-rate. A must-try for any smoker. 4) Cuban Crafters Cameroon: A great example of the sweetness and spice found in the African wrapper. It’s blended nicely with Nicaraguan filler to create a tasty, well-crafted smoke. Well worth seeking out. 5) Sancho Panza Extra Fuerte: Made by General Cigar, this Honduran puro is full-bodied and easy to find. With spice, cedar, and a touch of sweetness, this blend comes in six sizes. For more cigars that’ll impress without doing too much damage to your wallet, take a spin around our Cigar Reviews Archive. I heartily agree with #s 1-3 as these are some fantastic smokes (I can't speak to 4 and 5 as I have no experience with them). La Traviata is one of my absolute favorites from the past year; not "favorite bargain cigar" but "favorite period." Brick House is not far from it and Benchmade is a fantastic bargain with great taste (although the mixed filler makes me feel like I've gotten some chewing tobacco if I cut the head instead of punching it). Truly, thanks to the cigar companies who have responded to the economic downturn and increased taxes by offering some fantastic, low-priced smokes. One of my favorite value smokes is a cigar made by Oliva called El Cobre. it's a little tougher to find than the cigars on your list but it is a superb handmade long filler maduro and the Robustos are only about $4 a stick. It is a steal at that price because it really is a superb cigar. Agree with the Traviata. With most of their sizes being in the early $6 range, its a great smoke. The brickhouse is not bad either, to me it has some toasty flavor with a hint of cedar. When Im in the mood for those flavors, for the price it is not bad at all. With Many of the smaller Oliva sizes being in the $5 dollar range, they are also a great option. Matt – I’ve heard good things about El Cobre but unfortunately it’s still on my “to try” list. Terrific info, gents.The Casa Fernandez,Arsenio, is a smoke full of flavor and won't trip any wallet heat sensors.Oliva, also makes a blend called, Los Patriotas.The Illusione, Cuchuillos Cubanos, and on the milder side , Serafin De Cuba, ain't too shabby. How can you not like a blend where the owners answer e-mails and still man the phones? Give Empire Cigars in Raleigh a call. Hal(owner), Dave, or Derrick will be happy to help you. They have plenty in stock and I’m sure they’d be willing to sell you a sampler and ship them down to you. Unfortunately, they don’t have the e-commerce site up yet so you have to do it over the phone. I have enjoyed the La Traviata, and while I do support local B&M a few times per month, I paid $3.83 per stick for the churchill size last time I ordered on the net! I will seek out the El Cobre, thanks for the advice guys! Thanks for adding all these great recommendation! Great image, where did you find it? La Traviata hands down my favorite smoke, remind me the old style we used to get back in the 60’s and early 70’s!!! Wow! La Traviata sounds like it must be tried. This column & the comments are useful, as usual. Nonetheless, please note that to many people w/o much $, a category of $5 or less is too broad. Half of the cigars that I smoke cost $1.20 to $2.50; 45% cost 2.50 to $4; and only 5% more than $4. A cigar that is better than many others that sell for higher prices, is a bargain, but if it cost more than $4, for me (+ some other people, I guess) it is not a "bargain cigar". @senz: It is a great photo. Fortunately it was posted on Flickr with license to share it under the Creative Commons (hence the photo credit to the original on Flickr). Great article! I love finding great bargain sticks and #1 & 3 definitely fit the bill. I haven't tried the others but will have to keep an eye out for them. I agree with Ethan. "Bargain" means "under $3" to me (or "less than $50/box"). 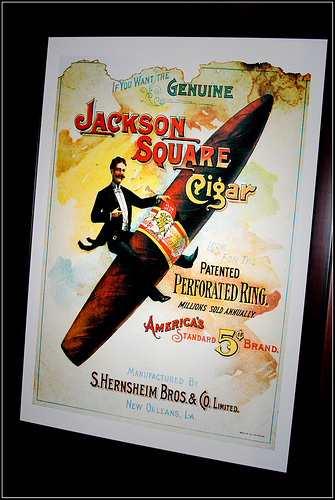 Many many excellent cigars are available in the $4-$5 range, particularly via Internet retailers and auctions. The $1.25 to $2.50 range is more challenging (which is part of the fun). For my money and guilty conscience, Famous Smoke has an incredible selection of great bargain house blends (i.e. Famous Nicaraguan 3000). Ethan & Beringer – These days it is, indeed, difficult to find good cigars for $3 or less, especially when you’re talking about single-stick prices. Though I bought and reviewed a box of Famous Nicaraguan Corojo Corona a while back based on a recommendation, I don’t like to review cigars that are basically available only by the box/bundle because even at $2 or less, it’s a significant investment to buy cigars you haven’t tried. Buying one stick for $5 and finding out I don’t like it is a lot less painful than buying 20 for $40 and finding out I don’t like it. Not only am I out the money, I’ve got all those sticks around reminding me! Yes, George, I once had more cigars that I did not like in my humidors, than ones that I did like. Donated some to troops, etc. but I still felt stupid. I don't get too excited anymore–no risking $ on 5-packs, samplers, etc.